Macbook Air – I write the early drafts of my novels in Scrivener and later drafts in Word. Mslexia Diary – only writing-related stuff goes in here; deadlines, submissions, blog schedule, etc. Notebook – for automatic writing (every day, first thing) to warm up my brain. MontBlanc Fountain Pen – a treat I bought myself for finding an agent (thanks Sallyanne!). Thank You Book – I jot down nice stuff that’s happened and get a kick from reading thank you’s from the likes of Seamus Heaney. ‘Drift Away’ candle – An idea I got from a writer/composer friend. I light it every day. I find the smell very relaxing. Rory’s Storycubes – sometimes, you need a bit of inspiration. Or just a bit of fun. Bog Cotton Coaster – no drinks disasters here please! Plus, my husband picked me some bog cotton when we were just friends, to send to me in the post – and lost his shoe in the process. Looking at it always makes me smile. Alice in Wonderland/Floral Desk Tidy – I got this designed specially on Etsy; you can turn each block to suit your mood. Antique Cookbook Stand – A gift which I love. I’ve never used it for cooking but I love the design and I can prop my diary/research on there. I’m fascinated by how different writers work. From the garden shed of Roald Dahl to the train journeys of Agatha Christie – I love seeing what makes each writer tick; how they can create the perfect space to create. So, what’s on your desk? I’d love to know! Your work area is lovely. 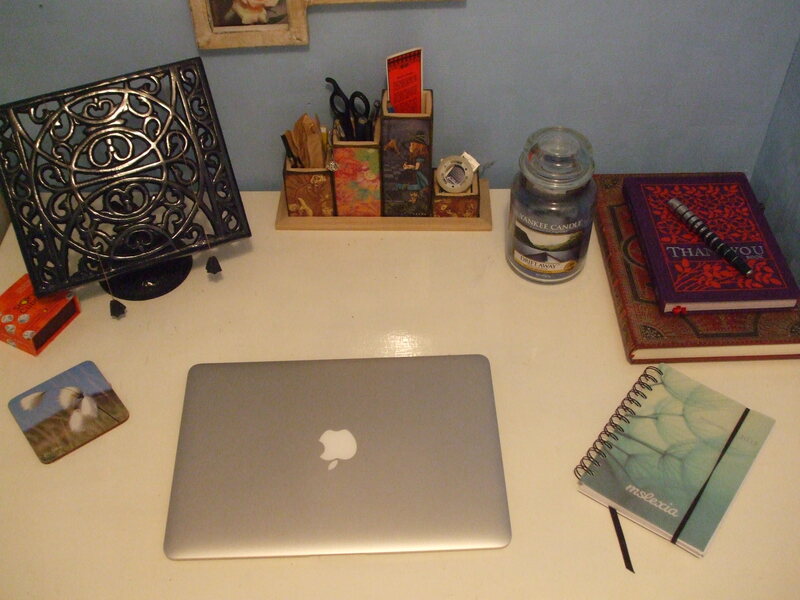 I love your Etsy desk tidy – that would make me smile every day. My desk has a couple of notebooks, research materials for whatever I’m working on, a lamp, a coaster, a variety of pens and pencils, my macbook and a big lump of crystal amethyst that’s supposed to aid sleep but just makes me happy. From my desk I can see my clarinet, photographs of my husband and daughter, a signed pic of Vincent D’Onofrio, various paintings and postcards and an ugly big treadmill. Thanks for sharing this – I always find it fascinating to see how others work. It’s so nice to have a few trinkets around that make you smile – I think it’s important to be in a place that feels homely and comforting. I’d love to see your crystal amethyst. We’ve been in Whitby today looking at the fossil shops and Whitby jet and there have been some gorgeous crystal specimens around. Have you ever visited Whitby?As soon as I read your reply, I realised how much you’d love it. Isn’t it amazing how well music and writing mix? Does the treadmill help when you need to think something through? You’re in an in-between state so a bit of chaos is allowed! Some people can’t work in anything but chaos – have you seen Francis Bacon’s studio? I think I’d cry if someone tried to make me work in there. Even when painting! Once again, nice to see music and writing mix – Nettie has a clarinet, I’ve a keyboard and you’ve a whole cosmos of instruments, no doubt (which makes me jealouser too). Wtf? Nobody said anything about having to have a writing desk! Don’t tell me I’m going to have to get one of those too. This is all your fault @nhead77 and @derekf03. Back to topic-I love your desk. 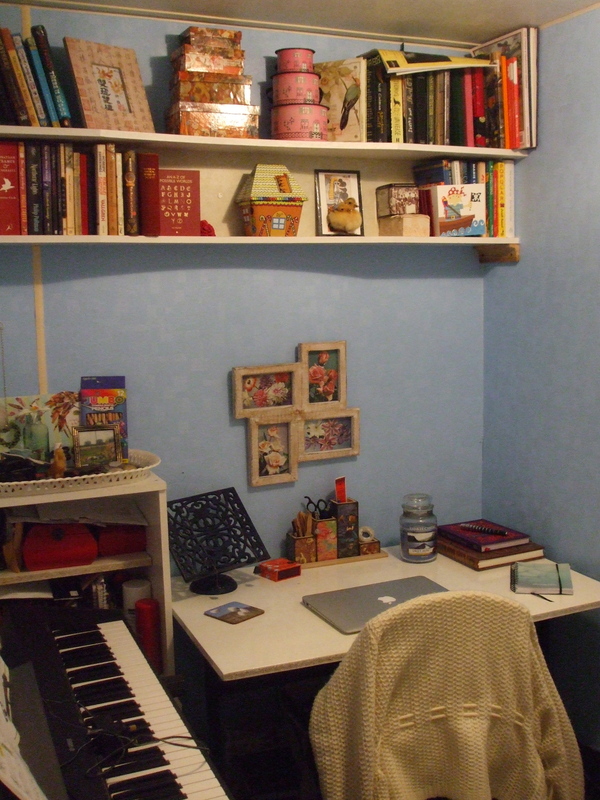 Clear desk, clear mind for writing. I love your book stand vis-a-vis the new mac and physical momentos to make you smile (always a good thing to have). Unfortunately my own desk is the kitchen table, the bed, the car, or any empty desk in the public or college library for now. I envy your order and beautiful simple writing haven! My own writing is grasped within domestic chaos – in the past I would procrastinate by tidying and then the kids/husband/meal times would have to take priority and that would be my writing time gone! And so I have learned to write within a disordered and hoarded space. I aspire to your order and beautiful simple writing haven! I wish I could be more focused, like you, and be able to write anywhere. I have to keep order otherwise I would fall into the procrastinating by tidying trap – that’s something I fully understand. Hopefully you’ll get your own writing haven soon. Hats off to you for doing so well without one.